The Akshaya Patra Foundation received a mid-day meal delivery vehicle from Chitra and Arvind Sonde. For the past six years Advocate Arvind Sonde has been associated with Akshaya Patra and is extremely inclined to extend support for opportunities for the girl child. He is specifically impressed with the transparency and financial credentials of Akshaya Patra. 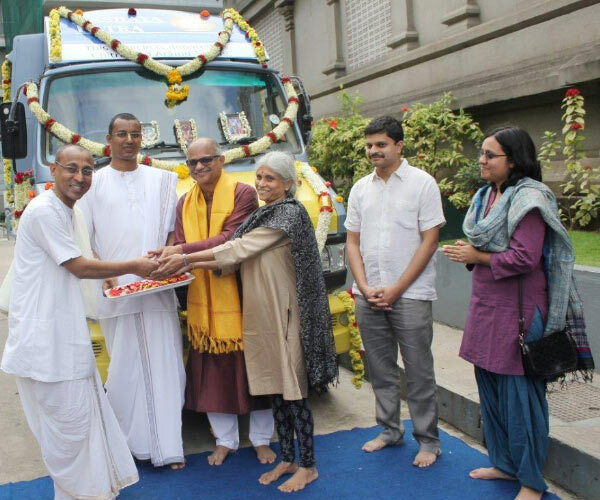 The vehicle was inaugurated at the Foundation's HK Hill kitchen on 21 November, 2015 where Arvind Sonde handed over the keys of the vehicle to Chanchalapathi Dasa, Vice-Chairman; The Akshaya Patra Foundation. The custom-designed vehicle is insulated to maintain optimal temperature keeping the food warm. It is also dust-resistant and helps retain the freshness of the meals. The meal delivery vehicle will be used at the Hubballi unit of The Akshaya Patra Foundation. It will help transport nutritious meals from the centralised kitchens to about 4,000 children in 40 schools every day.